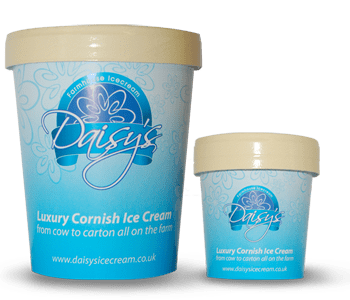 Located just over the Cornish border in Marhamchurch, Daisy’s Farmhouse Ice Cream is located close to the Ruby Way and has many customers in Ruby Country including the Viaduct Cafe. We take pride in producing our homemade luxury icecream using the freshest milk which is lovingly provided by our own cows in the morning and by the afternoon its icecream! We make small batches of artisan icecream, made in the Italian gelato style. Gelato is an age-old delicacy that dates back thousands of years and now its back in Cornwall again! Using our milk we have created a fantastically creamy icecream, which is packed with delicious flavours for you to enjoy including clotted cream vanilla, mint chop chip, strawberry, honeycomb and pistachio. We also make sorbet and frozen yogurt. Back to main local produce page. This entry was posted in Food and drink, Local produce, Uncategorized and tagged frozen yoghurt, ice cream, sorbet. Bookmark the permalink.